Anonymous 4 performed Thursday night in Coral Gables. 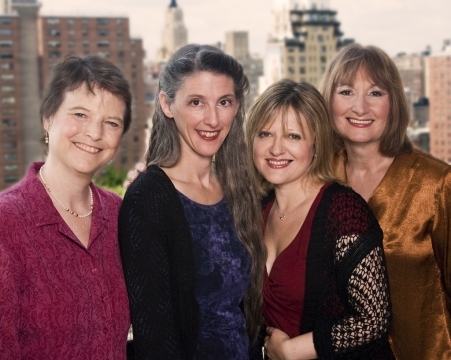 The female a cappella quartet Anonymous 4 wowed the crowd with spectacular vocal ability on Thursday evening as part of Miami Bach Society’s Tropical Baroque Festival. Although their repertoire is mostly drawn from the Middle Ages rather than the Baroque, the healthy-sized audience clearly didn’t mind the difference of a few centuries. Anonymous 4’s Anthology 25 anniversary program is a sampler from their 23 CDs, loosely collected into six thematic sections, such as Visions and Miracles and Sisterhood. A huge amount of educated guesswork goes into recreating medieval music, which often exists as vague shapes indicating pitches. Through substantial research and sublime musicality, Anonymous 4 has rightfully established itself as a premier interpreter of medieval music. Although their wide-ranging repertoire includes prominent male medieval composers, they have made special effort to bring to light music written and performed by nuns or noblewomen, such as Hildegard von Bingen. From the opening unison chant, Gaude Virgo Salutata, Anonymous 4’s pure tone and precise intonation rang true in the resonant apse of St Thomas Episcopal Church. Their vowel matching and perfectly coordinated attacks and releases created the effect of a single, supercharged ethereal voice. These plainchants, deceptively simple with a transcendent, hypnotic quality, proved to be the best performances of the evening. Anonymous 4’s polyphony was equally unified, and especially pleasing in the lighter, dancelike works, including Francesco Landini’s Ballata Ecco la primavera, and the rollicking trio Nicolai presulis, which included special vocal effects and toe-tapping rhythms. Although the first few polyphonic works drifted downward in pitch, Anonymous 4 settled into the reverberant space quickly, and such issues virtually disappeared for the remainder of the program. The most enjoyable works combined both unison and polyphony, as in Gratulantes celebremus festum, beginning with a brightly toned unison and moving into an equally gleaming polyphony over a drone bass. Susan Hellauer’s trills and vocal shakes sparkled above the texture. Anonymous 4 has branched into American music of the 18th and 19th centuries, and another memorable work was the folk hymn Parting Friends, featuring nasal Appalachian twang delivered with relish by Marsha Genensky on the primary melody. Each member of the quartet sang solo as well; Hellauer’s bright, expressive Mainte chançon ai fait was the best of these, capturing adoration for the Virgin Mary as she recounted the annunciation story. Also notable were Jacqueline Horner-Kwiatek’s richly dark An teicheahd go hÉigipt, and Ruth Cunningham’s space-filling early English Lullay my child – This ender nithgt. Three contemporary works were also included. The language of David Lang’s the wood and the vine is nearly the same as Anonymous 4’s medieval works, but his busier polyphony often obscured the text. John Tavener’s strophic setting of the Lord’s Prayer presented a repeating pattern of dissonance and suspensions resolving into consonance. Richard Einhorn’s The Scientist was a perfect fit, setting a short, repeated text in unison, then sliding rhythmic imitation, and finally the resonant harmonies Anonymous 4 performs so well.